The Bodymind Healing Center specializes in using ancient sacred wisdom traditions to help heal the “dis-eases” of modern life. We provide individually oriented psychotherapy and healing sessions as well as referrals to body-mind healers in the San Francisco Bay Area. The Bodymind Healing Center also provides classes and workshops in bodymind healing and publications on ancient and modern methods for healing the body-mind. We also have trainings and certificate programs for those members of the public and for health professionals who want to bring bodymind healing methods into their lives and work. We are also linked with the Health Medicine Center, which Dr Mayer co-founded and where he works one day a week. HMC is a team of traditional and complementary health professionals, whose exciting multidisciplinary teamwork is on the cutting edge of today’s revolution in healthcare…of which integrative health care and bodymind healing self-care are essential components. In the mid 1980s I, and many health professionals in the field of mind-body health, became uncomfortable with the overemphasis on mental approaches to psychological healing, and the term bodymind (Dychwald, 1986) was born. I wanted to apply this term to psychotherapy and healing, wrote a book about my approach on this perspective called Bodymind Healing Psychotherapy, and created the first bodymindhealing site on the web, called bodymindhealing.com. “Bodymind Healing Psychotherapy” draws from traditional forms of psychotherapy, bodymind and symbolic approaches to healing, hypnosis, energy psychology, Gendlin’s Focusing, psycho-neuroimmunological research, and ancient sacred wisdom traditions. Specifically selected treatments are mutually agreed upon and individually adapted to each person’s unique needs. Why the need for Bodymind Healing? Click here. The Term “Bodymind” as distinguished from “mind-body”…Click here. In two of my books, Bodymind Healing Psychotherapy: Ancient Pathways to Modern Health and in Energy Psychology: Self-Healing Practices for Bodymind Health, I discuss how integrating the body into psychotherapy has been shown by clinical research to be crucial to the process of healing, and how the body has formed a key building block of modern psychology in spite of the fact that many still associate psychology with the study of the mind. My use of the term “bodymind” incorporates the tradition of somatically oriented psychotherapy, cross-cultural ancient sacred wisdom traditions, and methods of postural initiation including Qigong. At the top of the list is the key ingredient… our authentic relationship with each other. “Real relationship” heals. All the methods listed below add to this quintessential element. Western forms of psychotherapy, including psychodynamic self-psychology, cognitive/behavioral, Jungian/archetypal. Tap into the wisdom of the body/mind and find the felt meaning of your issues with Dr. Eugene Gendlin’s “Focusing” method. Deepen your inner life with imagery, dream-work, and storytelling. Enhance your ability to relax and increase vital energy with: Acupressure self-touch and Qigong, a many thousand year old method of cultivating the energy of life. The Bodymind Healing Center has as a major goal the promotion of Qigong as a tool to enhance Western mind-body healthcare. Many people think of Qigong as being those beautiful graceful, powerful movements you see people doing in the park; but Qigong also contains static practices (stances from traditions of postural initiation), breathing, and self-touch methods that can be done in stillness. Dr Mayer has introduced to the field of psychotherapy how to bring Qigong into psychotherapy without ever using a Qigong movement or without ever mentioning a word about Qigong. For more information about the benefits of integrating Qigong with psychotherapy please click here . Esalen Institute, 2006: This “Crane Flying” practice comes from Hua Tau’s First century AD Five Animal Qigong Frolics — good for increasing leg strength, balance, and lightening the heart. Tai Chi Ruler Qigong: Adapted by Dr. Michael Mayer to be an East-West healing method by incorporating this healing visualization process. If you would like to purchase the entire 10 sets of Bodymind Healing Qigong, click here. Bodymind Healing doesn’t only come from seeing a health professional, but also from the visitations we receive from nature. 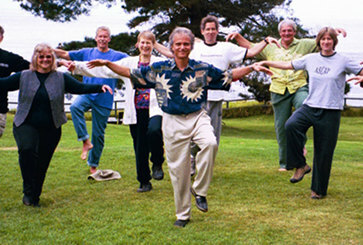 This photo was taken when Michael was on his way to teach a Tai Chi class at Esalen on how to sink your chi for healing. 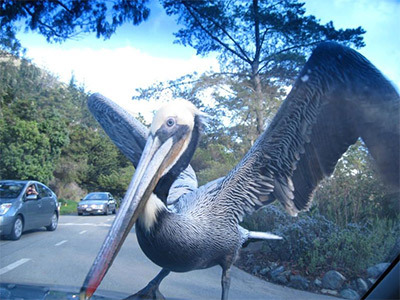 Synchronically, this Brown Pelican landed on his car and couldn’t be dislodged even with repeated attempts to get it to move by applying acceleration and brakes…showing who is the foremost teacher of the primordial art of sinking the chi:-) A whole chapter on this Pelican Sinking its Chi can be found in the book, The Path of a Reluctant Metaphysician (2012), along with a discussion of many practices that can be done in nature to enhance bodymind healing.